SAVE ON YOUR HOLIDAY !! Visit us in the months of April, May, June, or September, October, November. Cheaper flights, cheaper rents and PERFECT WEATHER !! 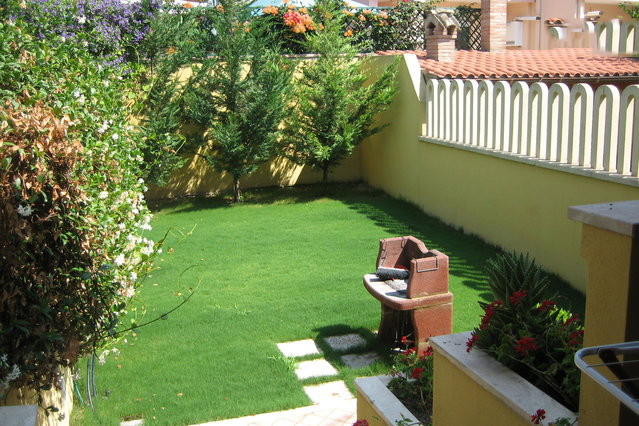 Modern house with 3 floors, fully furnished and decorated. 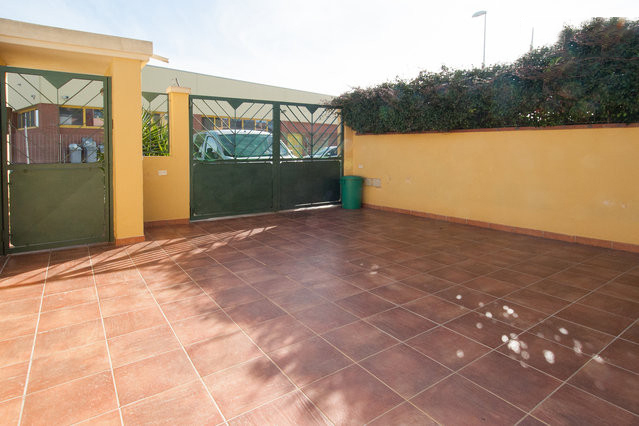 In residential and clean neighbourhood, close to supermarkets, public transport etc. We, the owners, are living in the “half” basement floor. 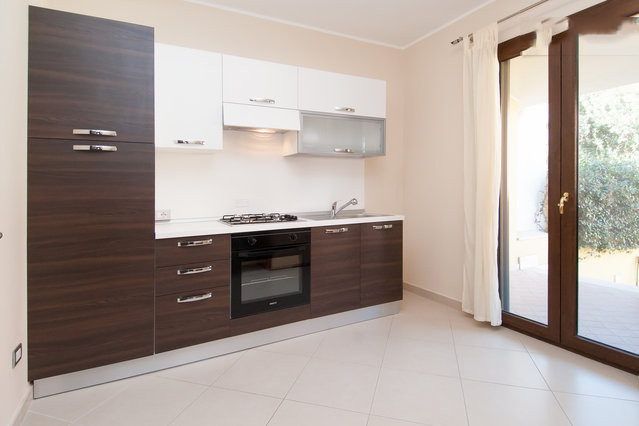 We rent the groundfloor and first floor for holidays. The house has airco and heat pumps in all rooms. The guests have their own separate entrance. The apartment offers space for 6 people but even if you come only with 2 people, it’s all yours without other strange guests. We speak Dutch, German, English, French and Italian. 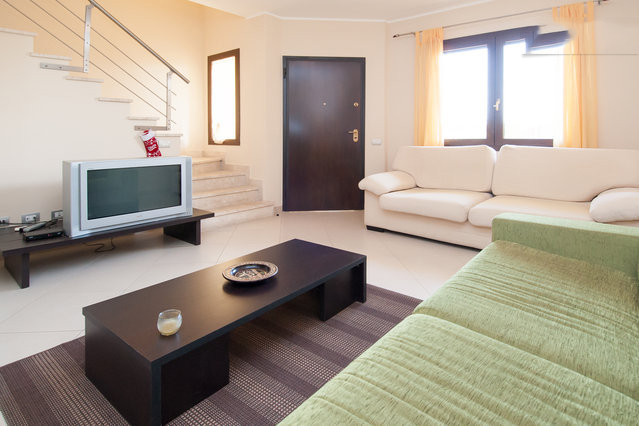 Livingroom with tv, 1 sofabed (2 persons), complete kitchen, 1 bathroom with bath, bidet and wc and a garden. 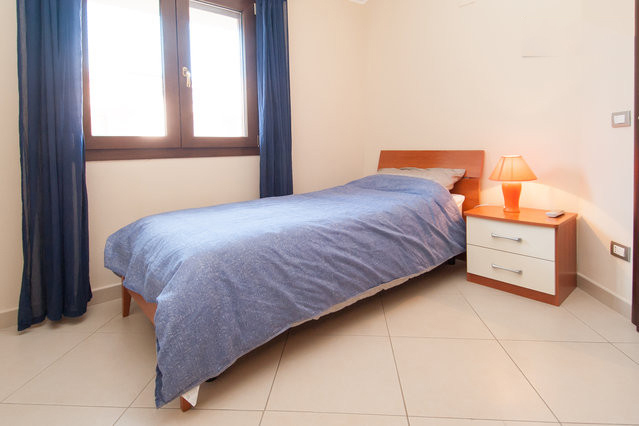 1 bedroom with doublebed and 1 bedroom with 2 single beds. The first floor has also 1 bathroom with shower, bidet and wc. The big supermarket Euro Spin is directly in front of your accommodation and is 7 days a week open. You can decide by yourself wether you prepare your own breakfast, or you will take your breakfast in one of the many bars in the neighbourhood like all italians do. At the bar one coffee with a croissant doesn’t even cost 2 euro. In that way you can get up when you want … If we have to prepare your breakfast we have to calculate 5 euros per person per day and by law we can only offer you prepacked food. Casa Salsa Libre is located in the south of Sardinia in the village “Selargius” with his almost 30.000 inhabitants. The distance to the capital Cagliari, with his 170.000 inhabitants just in the centre, is only 10 minutes by car or bus. Also the airport and harbour are only at 10 (car)minutes distance. From Selargius you can take a bus several times each hour which brings you to the city (Cagliari) and the beach (Poetto). 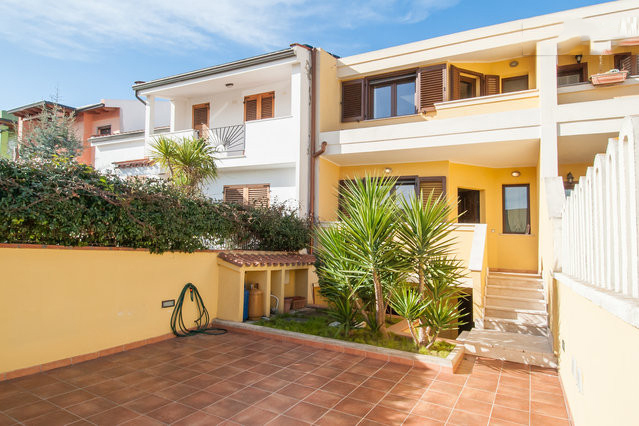 Casa Salsa Libre is also just 10 minutes away from the beautifull 12km long sandy beach “Il Poetto” (the famous beach of Cagliari and Quartu Sant’Elena) Casa Salsa Libre lays also at a strategic halfway point between the beautiful beaches of Pula and Chia (southern) and Villasimius (northern). From the airport you can take the train which brings you in 2 minutes to the center of Cagliari in Piazza Matteotti. There you have to take bus number 30 direcetion Selargius and you have to get out in Viale Trieste directly in front of the supermarket Eurospin. It’s only 10 minutes by bus. If you arrive at the harbour or Cagliari, you will arrive directly in the center at Piazza Matteotti. 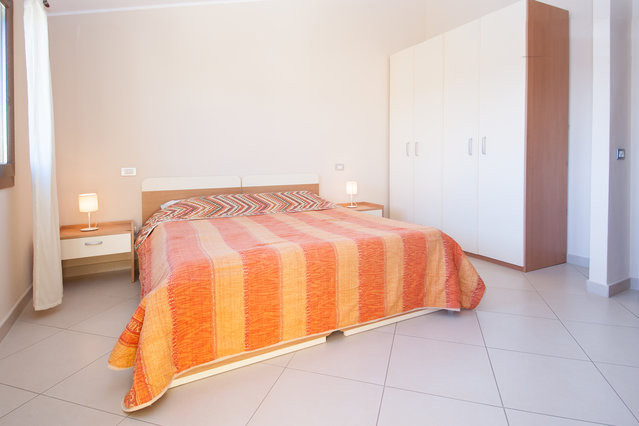 Directly behind the supermarket Eurospin, you will find Casa Salsa Libre in Via Francesco Crispi 55.
the period/month in which you want to rent the appartment. The price is inclusive towels, blankets, gas, and water. We will answer you with all the information as soon as possible. Should Casa Salsa Libre during the desired period already been booked, we can always offer you an alternative property of one of our colleagues. In wintertime you can dance salsa from wednesday until sunday in different locations in the city of Cagliari. From 1 july until 31 october you can dance 7 days a week OPEN AIR SALSA in one of the many beach locations at IL POETTO beach at Cagliari. Sardinia offers also a lot of possibilities for those who like motorsport even in wintertime. We can offer you Enduro Motor Routes with professional guides and/or training possibilities for motorcross at the Sardinian slopes in the neighbourhood of our accomodation. If, for reason of the winterweather, you can’t train at your place, you can come and train overhere. Also a lot of professionals are coming for wintertraining to Sardinia. Because of the mild clima, Sardinia offers you a lot of sport possibilities all over the year ! If you like we can prepare you a typical Sardinian dinner at home. You can choose various menus of various prices. Aiport Cagliari lays in the village Elmas, Via Dei Trasvolatori, 09030 Elmas Cagliari, tel. 0039070211211. If we have free time we can pick you up and bring you back to the airport. For one way it costs 15 euro. Cheap flights you will find with Ryan Air. Destination: Cagliari. For those who wants to come by boat, there are several possibilitys. The company TIRRENIA is one of the cheapest. Harbours from the continent: Genova, Livorno, Civitavecchia. From Porto Torres and Olbia its still around 200km distance to Selargius/Casa Salsa Libre. From the harbour of Cagliari its only 15 minutes by car.